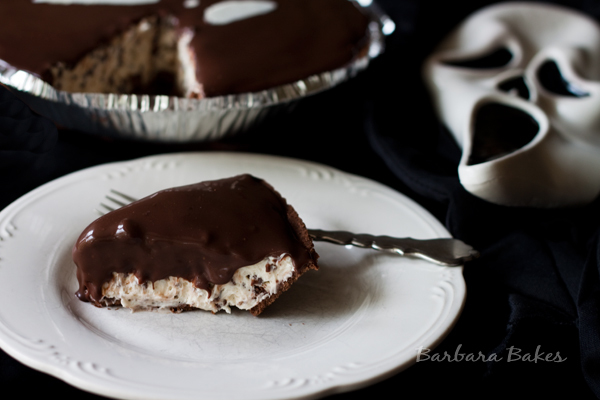 A rich and creamy, easy, no-bake chocolate chip cheesecake with a Halloween twist. Have you seen the new movie Hotel Transylvania? After I saw a commercial for it, I couldn’t get it out of my mind. Not because it was so scary, but because they mentioned scream cheese. I’d been wanting to do a post for Halloween, so I kept coming back to the idea of scream cheese. Since cheesecake is my favorite way to enjoy scream cheese I whipped up this quick and easy, no-bake chocolate chip scream cheesecake. I printed a Scream face pumpkin carving template and place it underneath a piece of parchment. Then I piped white chocolate over the design. I then put the parchment into the fridge to set up while I made the cheesecake. The recipe is adapted from my Robin Eggs No-Bake Cheesecake recipe. I substituted mini chocolate chips, spread it in a chocolate graham cracker crust and topped it with rich chocolate ganache. My daughter said I should have done a white chocolate background with a black scream face, but the pie was screaming out to be topped with chocolate ganache. In a large mixing bowl, beat heavy cream until medium peaks form. Set aside. In a medium mixing bowl, beat cream cheese, sugar, salt, and vanilla until smooth. Add cream cheese mixture to heavy cream and beat until incorporated. Gently fold in miniature chocolate chips. Spread batter evenly into pie crust. Refrigerate for at least 6 hours to set or overnight for best results. Place 2 oz. of chocolate in a small mixing bowl. Heat heavy cream on medium high heat until it comes to a boil. Remove from heat and immediately pour cream over chocolate and stir until chocolate is completely melted. Add remain chocolate and stir until chocolate is completely melted. Cool until ganache is thickened but still thin enough to spread. Spoon chocolate ganache on top of the cheesecake, spreading to edges. Refrigerate until ganache is set and ready to serve. Hahaha – scream cheese. Love it and love this idea! Happy Halloween! What a clever idea! Just perfect for Halloween. Deliciously decadent! Happy Halloween, Barbara! That mask is way creepy! Your cheesecake looks so rich and tempting. Can I please have a piece with my tea? Oh Barbara this brings back scary memories. Scream was the first scary movie I watched (I was 12) and I couldn’t sleep in my own room for weeks! 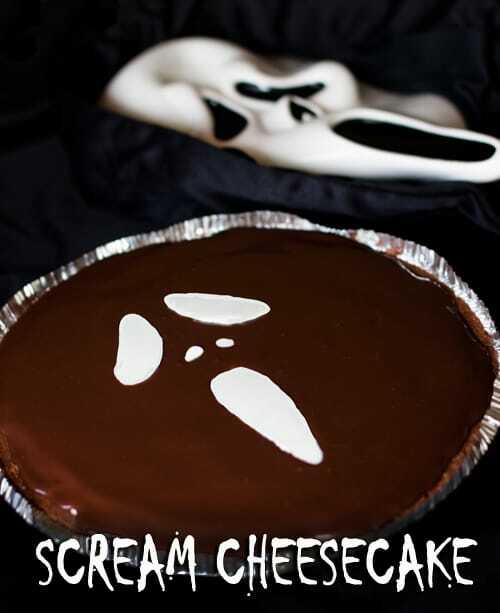 I might be able to handle a scream-cheese cake though! Now this is cute. I love the simplicity and the lack or orange (my least favorite color!). Bet it tastes great too. i’m way over due for making a cheesecake also and your version looks awesome. i was interested to see that you said it was best left over night to set up – how does that work w/ the whipped cream? it doesn’t deflate or does the cream cheese stablize it? i’m just wondering how well it lasts? not that it doesn’t look as though it would be just gobbled up but there aren’t many in the household and we shouldn’t eat it all in a seating or two. Scream cheese – LOL! Love how you decorated this delicious-looking chocolate dessert! Oh yeah buddy! Love this idea!! Such a cool and smart idea. I would totally make this and my nephews would go NUTS for it! You always have the most wonderful ideas and delicious recipes. I love receiving your updates..THANK YOU!! Looks fantastic to me. Great idea for decoration. A devilish treat and great idea!